Mary, this is a four unit and I have owned and managed off and on since 2011. When you compare the financials I am sure the differences in profit between the two investments will be very apparent. Also compare the returns for houses in that area. There is a reason that my portfolio consists of 75% houses and 25% multi family properties. Since you're a newbie I highly recommend to stay away from war zone properties such as the above listed on Walker. The property is overpriced especially for that area. You can search this property and similar war zone on Trulia in the crime section. One note on this specific investment, the property was bought ($21,500) and sold several times by the same owner and investor in the last few years. This should be a red flag. I'm not a hungry realtor trying to sell you anything but only to help other novice investors to succeed. Feel free to contact me directly. Good luck. I'm familiar with the area and since I'd be residing there as well, I would be more choosy on location. If it was purely for investment purposes, I'd look at it differently perhaps... Thanks, @Adam A. @Adam A. Feeling a little unprofessional today are we? I would hardly describe myself as a hungry realtor anymore than I would refer to you as a newbie. I would also hardly call 43612 ZIP Code a war zone...But I guess one man’s trash is another man’s treasure I guess but I have done quite well there. I fully agree that investors do well across market places and property classification. One person class D property is another one class B. @Andrew Fidler I gave my professional opinion about the Walker property you're trying to sell. 43612 is a spotty zip code and the property is in class D- war zone as it shows on Trulia. Read my statement above again " I'm not a hungry realtor trying to sell you anything but only to help other novice investors to succeed." On the other hand, you had always directed your attack on me and the lead ordinance as "Money hungry inspector". Since you're talking about professionalism, you should refrain yourself from trashing me on Facebook. @Andrew Fidler Fidler I gave my professional opinion about the Walker property you're trying to sell. 43612 is a spotty zip code and the property is in class D- war zone as it shows on Trulia. I'd disagree on the Walker property. Ohio Cashflow does a lot of deals in that area and we find it to be quite solid. No offense but I thought you had buyers lined up for you all of your properties. Let me know when you can take 30-50% of your asking price and I'll buy everything you have available. There is no point of listing them on the MLS. Sorry mate but I have to be a bit sneaky with my comment. good and bad areas, however, I was specifically discussing 4022 Walker. As shown in the image, there are 36 crimes within 1-2 blocks which is the highest in the neighborhood. My properties are mostly in 43615 which is the largest zip code in Toledo. Generally this zip code has a lot lower crime rate. Having a great realtor is the key to buy properties at a deep discount BEFORE they hit the market. @Adam A. - I'm sorry to hear your comments are personal in nature, but I guess that explains why a conversation of valuing property and profit/return of a $250k 4 unit vs a $100k 4 unit turned into a rant about my being a realtor (about 5% of my BP persona). Please enjoy 43615, I will continue to do so in 43612, 43613, and 43608. Every investor who stays the course and keeps a niche will make money, I simply choose to do mine where it makes cents...enough cents that I don't use loans or mortgages so I'm doing something right. It's been a while since I've simply posted the offer but just 12 hours ago I spent my Friday evening driving an out-of-town investor around Toledo. The best way to understand a neighborhood isn't to browse the internet it's to get boots on the ground and see how normal the people and properties truly are. If you come to town I commit to set aside time to show you around, explain what has worked for me and what has not. Sure I hope to help you invest in Toledo and I run a property management company to operate what you buy, but fundamentally I hope to evolve Toledo in your opinion from "Little Detroit" to its own developing (appreciating) community. I grew up in Toledo, I invest in Toledo, and I'm happy to show you how I made my fortune IN TOLEDO. 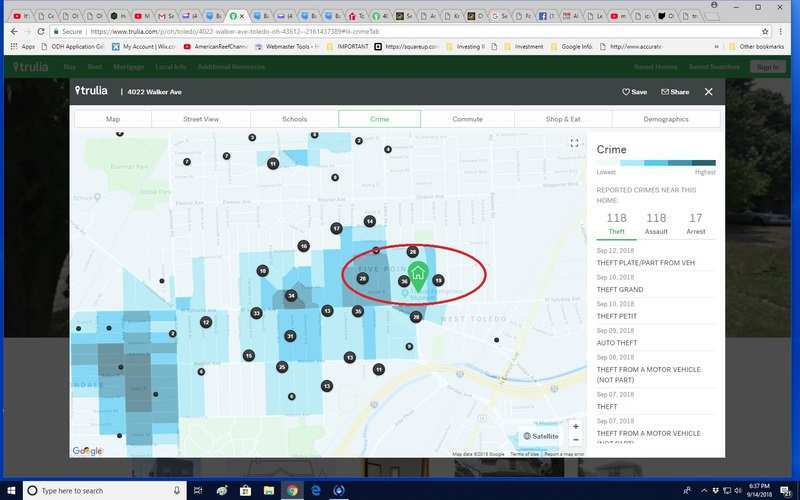 I will admit that the pocket just east of Lewis and North of Sylvania (See my attachment) is a bit rougher than the rest of the 43612 zip code. I have made it a mission as the biggest buyer in town (Shameless plug, sorry lol) to gentrify the area. We have probably bought, fixed and sold 10+ in that pocket recently and are looking for more. Vermaas, Walker along with Asbury are all "our" streets. The 43615 zip code is very good buying across the entire zip code. I don't even think there are rougher parts of the 43615 code. There is a lot more to it then just having a great realtor. You wouldn't believe how many investors have recently come to us wanting our property management company to manage the S#@% they bought off the MLS or thinking they can buy distressed and fix on their own. I'm honestly not sure where or how this trend started but it's becoming overwhelming. Most of these folks in a year or 2 come back begging us to solve their problems. I think it's awesome that you have the time to truly show the investors around town so they can see the areas. I've been saying for many years now that what $60,000 - $80,000 buys in Toledo which is a SOLID B CLASS area and property, would buy a C or D class in any other city. 1) Do you work as a buyers agent for out of state investors and get them to buy of the MLS? What about distressed and off market deals? 2) Who does the rehab on them? Investors hire contractors themselves or do you also assist with the rehab? 3) Property management is crucial to ongoing success with the investment. What are your PM fee's? You can message me and respond privately if you wish and I ask out of pure curiosity. You might as well respond on here for others to see that would like to work with you. Interesting convo. I would consider 43612 a little rough in pockets but nothing like 43608. Westside is getting a little rougher by the day but still nothing like LaGrange and Central area. But I also would not look to pay $100k for any property in 43612 maybe 43614 I would pay that kind of money. But that is me and to each their own. The only neighborhoods I won't look at in Toledo are the Greenbelt and Nebraska and Junction. @Zareth Gray you know we are talking about a a 4 unit apartment building, not a 3 bedroom house, right? @Engelo Rumora - let's see what spin I can put on the questions, like my investing strategy...I really just connect with buyers and sellers through networking and see what I can do to bring them value. There's no real master plan beyond the reality that once I have thrived in 43608, there really isn't a tenant I can't manage or a property I can't tackle. That said there definitely are requests have had to I turn down...I have had investors approach me after they buy the wrong property, in the wrong place, in the wrong condition (really at any price) and I can't responsibly rehab and manage a turd. Those really need to be donated or sold on Craigslist (Detroit Avenue comes to mind). I have had a bunch of investors come to me post-Sierra Realty (search the forums if you're unaware)...these properties are never what we expect them to be and the owners genuinely need help to avoid walking away from Toledo. I try to do my best to assist those who have been genuinely sold up river, the goal is to invest in Toledo profitably, responsibly and ethically. My biggest interest in a client is that they appreciate what I bring to the table vs their own ambition to run everything themselves. It's not going to work out if my company tells the tenant to pay or leave and they contact the owner and get to renegotiate. My goals are to be the best within my niche...I'm not interested in managing all of Ohio or even Lucas County. I am the best within North Toledo, I am also not trying to be the cheapest (call me after you've tried the cheapest in town and see how the return looks). As to representing buyers for new properties I use an agent contract so if they buy a property off-MLS (which is where most of the deals are) then the buyer pays me directly. Any property I take over as agent I take responsibility for all the way through renovation and tenanting. A major caveat is that I have learned that I don't have enough hours in the day to run concurrent $30k renovations for investors so I am very sensitive to ensuring we are targeting quality properties for basic renovation, not targeting fire-damaged properties for massive rehab. I'm not sure I've answered you well Engelo...when my phone rings I try to assist each client in their goals. I turn down more clients than I evict tenants so I'm either smart or stupid...but at the end of the day I try to be building the reputation of Toledo and responsible real estate investors. @Francine Brown - the Lucas County Land Bank started marketing houses through realtors and pushing to get prices close to bank foreclosures as much as they can. I successfully purchased and rehabbed three about five years ago, but our Landbank is very focused on who the end user is and their capability to afford the rehab. I haven’t heard of out of state investors successfully purchasing Landbank houses. I stopped buying Landbank houses when the price approached 80% of what I could buy a basic bank foreclosure for...no title encumberence, no personal application and credit check, no written agreement of the scope of rehab. I’ve stuck to them ever since. @Francine Brown I've done very well with the Landbank in Toledo. The trick is dealing with an honest realtor who is looking for your best interest in the long run. Having a good crew to renovate at reasonable prices and you need to be knowledgeable of the local market. @Andrew Fidler yes I noticed that in order to rehab some of these, sometimes the landbank pricing is too high to even cover rehab costs.. i am all for being a reason to an improve an area but is can't cost us more than property is worth you know, lol.. :-) I am pretty happy with our realtor so far.. we have been out to meet our team that we interviewed and so far I am happy. We are just having a bit of trouble finding some deals I found a few but they went off market fast, lol.. we have our process down faster now but we have to be patient. What do your COC and returns look like 1-5 years? where do you estimate your capex..
market is starting to trend towards a buyers market not quite there but closer than it was even two months ago..
Hey guys, my wife and I were born & raised in NW Ohio, and I went to school at UT. We've since moved out of the area courtesy of the armed forces, and have landed ourselves in DC, but we are wanting to jump into the real estate investment life. She's a realtor here, but with the prices so high, and my creative financing skills not yet developed, we have been discussing other areas we know well: BG/Toledo. Since we're at the beginning stages of investing, I'm curious what you guys think we should do next as our "next step" in this venture? We have educated with BP books and podcasts, and other print resources, and are very knowledgeable about how the home buying process works (again, Realtor wife); I say this because we would like to be able to benefit from buying below market, improve for 10% appreciation+ in year 1, and then rent, and not necessarily pay market value from the get go. We also have family in the area that we visit multiple times per year, so we would be able to check in periodically. So what do you think? Good to keep considering? We would want multifamily to start, moving into larger multifamily when available and as capital increases. I think it goes without saying that if you can buy a property for $2,000, it's probably not in the best area... But the entry price to get into the market keeps us coming back to considering Toledo as our first foray into investing. Thanks for the mention Tim and I hope that you have found my content valuable. My #1 tip to you and every other investor would be to take your time. Don't rush because the market isn't going anywhere. And even if it is, who cares. Where one door closes, another will open. There are and always will be so many opportunities when it comes to real estate investing. Anyone that tries to influence you or putt pressure on you is wrong and you should run the other away. Learn from your mistakes and don't repeat them.